Dry riser course for the training and examination of dry riser service technicians. This course covers the routine inspection and maintenance of a dry riser system as prescribed by BS 9990: 2015 and is designed to prepare the candidate for the examination. It does not include the installation or repair of dry risers. Successful candidates receive a certificate of competence. 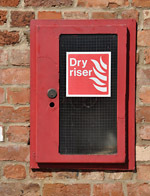 The dry riser course and examination (with practical hands-on instruction and demonstration) is a one day course and is ideal for anyone wishing to undertake (and become a ‘competent person’ in) the routine inspection and maintenance of dry riser systems.